Mr. Denny Reiser, well known for leading his history, nature, and flower walks for the Cuyahoga Valley National Park, Summit County Metro Parks, and the Cascade Locks Park Association, will lead you back in time from when the Ohio & Erie Canal was in its infancy, up until the great flood of 1913 which was the end of the Canal's function and use. The Canal is said to have been the main reason Akron exists, as there were so many locks in such a short distance that travelers got off their boat while it made it's way through the many locks, spending a day or longer along this area. You will learn about the canal, the mill race, as well as the many mills and furnaces along the mill race. 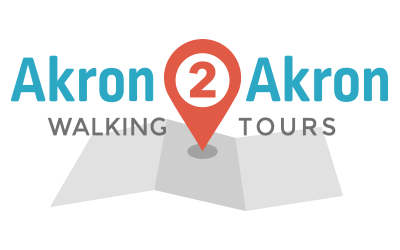 You will learn about the industrial and commercial history of Akron, and what life was like in the 1800's in Akron. Parking: Cascade Valley Park Trial Head parking lot off of North St. There is also plenty of street parking on North St. The powerhouse foundation at Beech St. Cascade Lofts & the new canal bridge to the planned Cascade Village loop trail.